What type of procedure does Davidson's Air Conditioning & Heating use to clean my system? 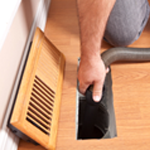 We feature the Rotobrush air duct cleaning system, which has been the air duct industry leader for almost 20 years. Our technicians keep up with the latest advances in Rotobrush technology, and we believe this system provides some of the most effective and efficient air duct cleaning for our homeowners. Rotobrush’s powerful patented brush–and–vacuum method and removable pod design allows our qualified technicians to get to the most hard to reach places. Homeowners prefer Rotobrush 2 to 1 over the competing air duct cleaning systems, and our customers are always pleased with the results. All grills, registers, diffusers and plenums are cleaned and sanitized. After the cleaning, an EPA approved sanitizer is fogged through the system. This sanitizer will kill mold, bacteria and fungus.